There's a reason that Queen Elizabeth Park is one of the most frequented spots for wedding pictures in Vancouver: it's flat-out stunning. With its gorgeously-landscaped quarry gardens, fabulous scenic vistas and 1,500-tree arboretum, the park is a world-class public space and one of the most beautiful places in the city. Perched atop Vancouver's highest point and covering 130 acres (52.78 hectares), Queen Elizabeth Park is second only to Stanley Park in popularity and annual visitors. At its peak is the park's plaza, a paved area with panoramic views of downtown Vancouver, a courtyard of dancing fountains and the Bloedel Conservatory, home to more than 500 tropical plants galore and 120 birds of various species. From the plaza, visitors can follow the winding paths down to the quarry gardens, ponds, lawns, and arboretum. The two quarry gardens are horticultural delights, with pathways and little bridges and mini waterfalls set amongst hundreds of plants and flowers. Private spaces for rest and contemplation are easy to find, and the plentiful trees--over 3,000 throughout the park--provide shade in summer and abundant color in fall. Sports activities at the park include the Queen Elizabeth Pitch & Putt golf course on the east side of the park, disc golf (frisbee), Tai Chi in the morning atop the plaza, lawn bowling, and 18 free tennis courts that are first-come, first-serve. Seasonal events also take place here. Every April the park is illuminated with lights for the sakura festival to celebrate the arrival of the cherry blossoms and make the most of the fleeting beauty of the flowers as they sweep through the park and across the city for a limited time. Queen Elizabeth Park is located at the junction of Cambie St. and W 33rd Ave, but there are entrances on several sides of the park, including Ontario St. and W 33rd Ave, or along W 37th Ave, between Columbia St. and Mackie St. While there is limited free parking along the edges of the park, parking lots close to the centre plaza are $3.50 an hour. You can avoid driving by taking the bus (#15 from downtown may work best; check Translink) or by biking. Cyclists can use the east-west Midtown/Ridgeway Bike Route, along 37th Ave, which passes right by the park, or the north-south Ontario Street Bike Route. Once called "Little Mountain"--the site is 501ft above sea level--Queen Elizabeth Park began its existence as a basalt rock quarry in the late 19th century. Originally owned by the Canadian Pacific Railway (CPR), the quarry provided the foundation rock for many of Vancouver's earliest roads. By 1911, the quarry had closed and the land sat, unused, for three decades. Eventually, the CPR sold the land to the City of Vancouver, who renamed the site the Queen Elizabeth Park in 1940, after a visit by King George VI and his consort, Elizabeth (Queen Elizabeth II's mother). In 1948, Vancouver Park Board legend William Livingstone began plans to develop the park into the horticultural beauty it is today by planting the first trees in the arboretum. 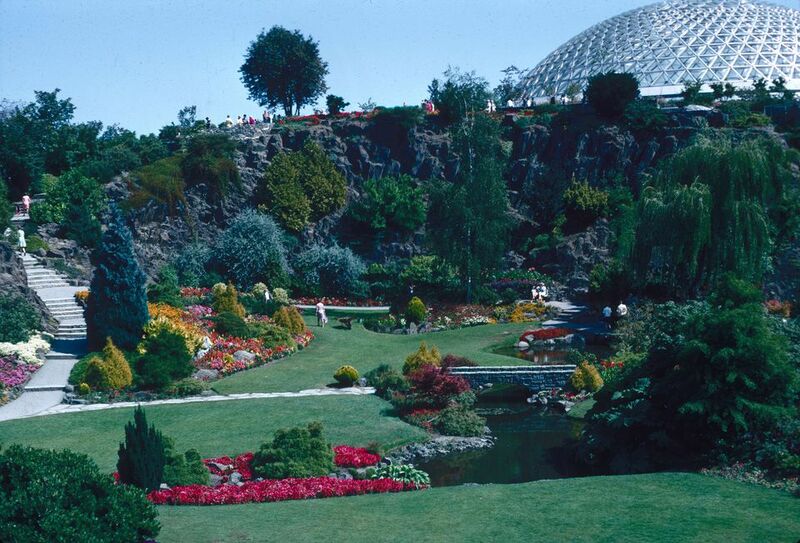 In 1969, Prentice Bloedel, founder of Canadian timber giant MacMillan Bloedel Ltd., and a patron of the arts and horticultural, gave the park over $1 million toward the development of the plaza, covered walkways, fountains and the domed Bloedel Floral Conservatory. It's easy to spend the day at Queen Elizabeth Park, strolling the gardens, visiting the Conservatory, or just enjoying the views. A visit to the gardens and plaza alone will take about two-to-three hours; combine that with a game of golf or tennis and a picnic and you have a perfect outdoor day. Capping off a trip to the park with a meal at the Seasons in the Park restaurant is a great idea, too. Seasons in the Park boasts some of the best views of the city and is definitely one of Vancouver's best restaurants with a view.